Before shoeboxes can bring hope and joy to children around the world, each one has to be carefully inspected and made ready for overseas shipment by volunteers like you. Hundreds of thousands of shoeboxes are collected during National Collection Week, the third week in November every year. Before these special gifts can bring hope and joy to children around the world, each one has to be carefully inspected and made ready for overseas shipment by volunteers like you. 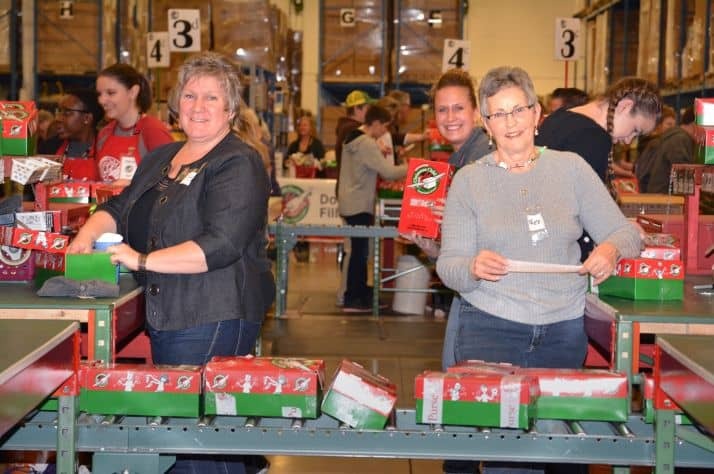 You can help prepare shoeboxes for delivery by volunteering at a processing center in Canada, where about 16,000 volunteers serve each year. We have opportunities for volunteer groups of all sizes. You can volunteer as an individual or with family and friends. At our Operation Christmas Child processing center, you will work with hundreds of other volunteers to inspect shoeboxes and ensure that the contents are appropriate for children and meet customs regulations (as outlined in our how to pack a shoebox instructions). Shoeboxes are also prepared for shipping and loaded into sea containers to begin their long journey to hurting children around the world. Bring shoeboxes with you when you come to your shift! Learn how to pack shoeboxes here. You can also pack shoeboxes online at PackaBox.ca. In the Calgary processing center we have year-round special volunteer projects like Pack A Box and Material Distribution (preparing all the promotional materials to go out in the fall). If you would like to learn more or be notified of upcoming volunteer opportunities in Calgary, please call 403-250-6565 or email occ@samaritan.ca. Every volunteer in the processing center plays an important role in the ministry of Operation Christmas Child, ensuring the integrity and successful delivery of the gifts. Volunteers in the processing center form teams and perform all the tasks necessary to process the shoeboxes. Teams are responsible for removing financial contributions from the shoeboxes, inspecting the gifts, sorting inappropriate items, working with filler items, separating boxes by age and gender, and packing shoeboxes in designated cartons. Due to the fast-paced environment of the warehouse and changing needs, you may be asked to do different tasks. We appreciate your flexibility. Yes, we recruit staff to help coach volunteers in the processing center. In the summer, check our employment page to see what employment opportunities exist for each processing center location. The processing center is open late November to mid-December to prepare shoebox gifts for international shipping. Children under the age of 14 are not able to volunteer in a processing center; however, tours are available throughout the season when families or groups with children under 14 or individuals who want to know more about the project can come to the processing center. The tours help people learn about the journey of a shoebox, what we do at the warehouse, and how they can pray for children receiving boxes. Tours of the Calgary warehouse are available year-round, please email occ@samaritan.ca. The processing center is located at 20 Hopewell Way NE, Calgary, Alberta, T3J 5H5. What should I wear to the processing center? Our processing center is in a warehouse, so please make proper provisions to be comfortably and appropriately dressed for this environment. Be prepared with closed-toe shoes appropriate for standing for long periods, and warm, layered, casual clothes as the temperature inside can vary. Breaks are available as needed. Email occvolunteerab@samaritan.ca for shifts in the Calgary processing center.